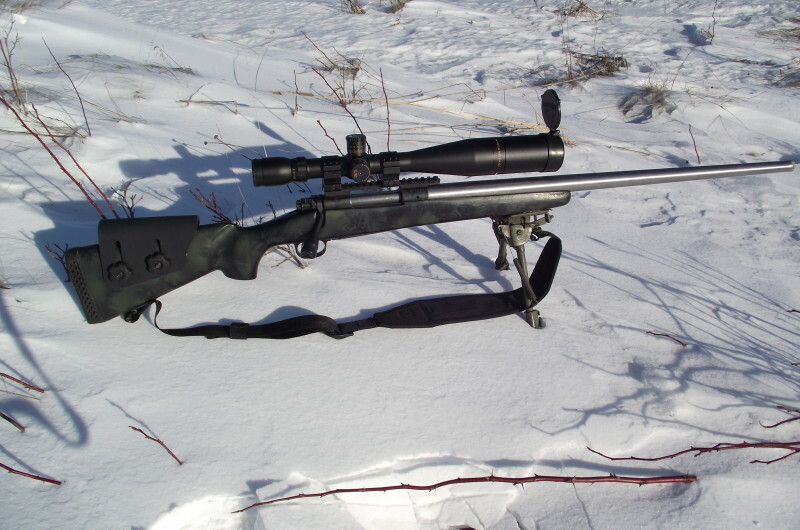 The journey began several years ago in my quest for long range hunting accuracy. Taking my old Winchester Model 70 in 300 win mag after the factory barrel just wouldn’t cut it any more and deciding on a new barrel. I’ve no idea how many rounds went down that pipe but it was many. The first barrel on it was a Bevon King SS match heavy contour with a 1-9 twist for the Sierra 240gr. Matchking and off I went to try my hand at 1000 yard shooting. Lesson 1 was the Bushnell Banner 3 to 9 and standard 2 piece base set up wasn’t going to get me there. Over the winter I got a one piece base and cut a piece off a .020” feeler gauge and Devconed it into place. Then for a whopping 60 bucks I bought a Futong Tactical scope at the Prince George Gun Show. 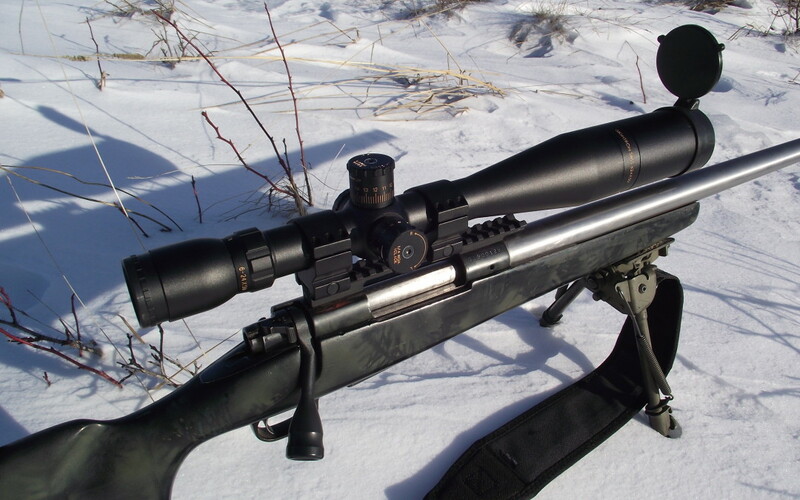 Very good looking scope. 2nd shot it turned into a kaleidoscope, hilarious. Sent it back to the dealer in Vancouver and within a week another was in the mail box. This one made it to about 5 shots then did the same thing. Actually the scope was worth the money cause to this day my Grandsons still have a ball with it. Then came the Wotac out of Oklahoma from Wonders Optics. Also a tactical job. Love the hash mark retical and the windage and elevation adjustments were dead on and repeatable. Unfortunatly the optics were only a tad better than had they been made by Mattel. Out shooting one day and at 600yds I couldn’t make out the big red cross on an 18” target. Then my loving wife said to me, “quit screwing around you cheapskate and get a good one to start with!” God I love that woman. Tried several times to contact Matt Wonders to see if an upgrade or a warrantee check over was in order but Matt was nowhere to be found. Of course the word “Nightforce” kept coming to mind but so did the word, “bankrupt”. So while reading up on reviews of Nightforce I kept coming across forum reviews on the new SIII Sightron. I kept reading “performance and clarity better than Leupold and comparable to Nightforce”. After numerous encounters with similar statements I decided to check them out. Found the Sightron web site and did some reading. One of my big concerns was warrantee turn around times after waiting 7 months for a bushnell 8 to 32 off my bench gun to make it back. I called Sightron and was told they try to have a scope repaired or replaced and out the door within 2 weeks. Of course they can’t speak for Canada Post. I do. Kids cover your ears. Then I hit find a dealer and to my surprise there was Jerry of Mystic Precision. So phone Jerry I did and knowing he wouldn’t sell me snake oil I listened to what he had to say. Swearing by the brightness and clarity of the scope not to mention the tracking and repeatability I had to give it a try. After rebarreling again to a Kreiger 27 ½” 1 in 10 twist and waiting for the bleeding to stop from Christmas I told Jerry to bring one up for me in 6 to 24 with the moa reticle. I do like the hash marks and in particular calibrated for max power of 24x. The scope arrived and I couldn’t wait to get it home and have a look through it. I took it out of the box, stepped out onto the deck and peered through it into the 150yds visibility and blowing snow. Looked pretty good, NOT. That night I mounted it on my shooter and next day took a drive up to the weigh scale hoping a buddy was working. 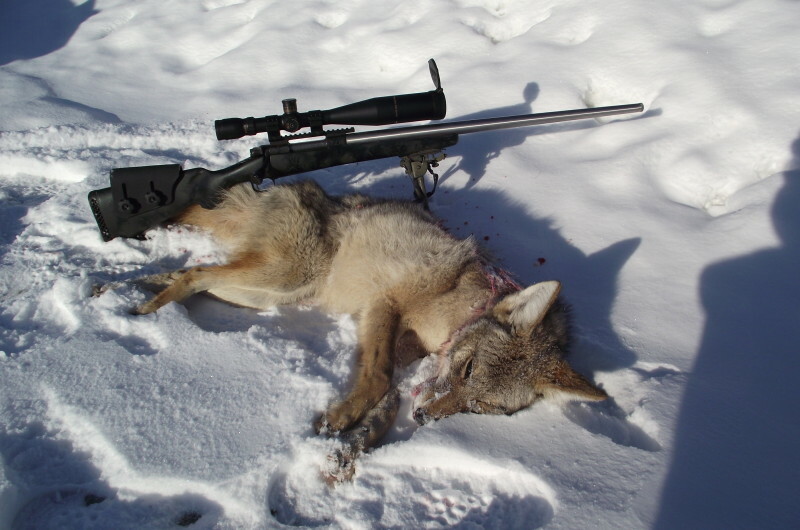 He was and we layed the rifle across the hood of the car and viewed the snow covered hay fields over 1000yds away. He used to be a Leupold man, not anymore. I couldn’t believe being able to clearly see individual stocks of hay sticking up through the snow at over a grand away. Later that day I went to another field and sighted in. 1” right at 50yds , moved 2 clicks then moved the target to 100yds. Fired one and windage good, 2 “ high, adjust 1 1/2moa up then moved the target to 300yds, fired one and dead on zero. Fired a 3 shot group, under an inch. Moved out to 500yds, elevate 5 moa, dead on, fired a 3 shot group, a tad under 3”, adjust down down 5 moa, same hole as before at 300yds, thought about a box test but in my reading this scope has had the crap box tested out of it. I’m heading home a happy camper and I’m still tickled I could clearly make out the bullet holes at 500yds in the white. Hard to see in the red. Next weekend I’m out looking for coyotes, squeak for about 45 minutes and a dog comes booking it over the hill from the south, sees my red Hyundai Accent and stops dead in his tracks at 544 yds. I elevate 6.25 moa and let out a squeak to get him to quit pacing then send it. Impact was within an inch of where I wanted. At first when I got him in the scope at 24x I had to hesitate and look because I could see each individual black tipped hair. It was like a Bateman print. I had to tell my self, “oh yeah right dummy, shoot”. I wouldn’t hesitate for a second to recommend this scope to a friend and its something I should have bought a long time ago. Mind you the Grandsons are sure having fun with that Futong.